If you are receiving an error message or are experiencing other difficulty when logging in to the review portal, please try the following steps. Verify that you are going to the correct URL. 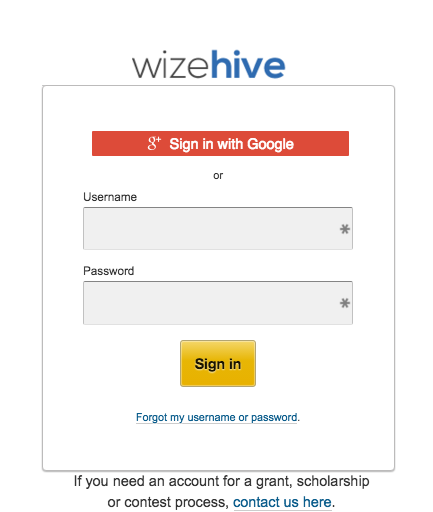 If your landing page is app.wizehive.com..., or looks something like this... you are not in the right place! Please verify with your program administrator the correct URL. Verify that you are typing your email address correctly in the Username field. It is possible (a) that you entered your email address incorrectly, (b) your program administrator made a mistake when adding you into the system, or (c) you have created a username at some point in the system and you are entering your email address instead of the username. 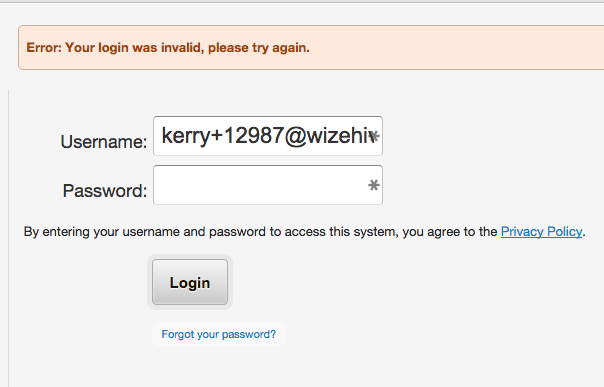 You will have to use the username if you have one instead of your email address. If your email looks right, you may want to verify that it is the same email that your administrator has in the system for you. Verify that you are typing in the correct password. Most likely, your program administrator created your account on your behalf and sent you an email with a password in it. Please make sure that you are entering the password exactly as it is in that email; passwords are case sensitive, so make sure the lower- and uppercases match. If you cannot find the email or cannot remember your password, follow the instructions here to reset.